Mary Fedden is well known as a still life painter. However, what can at first appear simple and effortless belies her skilled use of carefully considered composition, her particular choice and juxtaposition of objects and her impressive understanding of colour. What excited Fedden was the actual process of painting; her exuberant manipulation of paint is often not apparent in reproductions of her work. 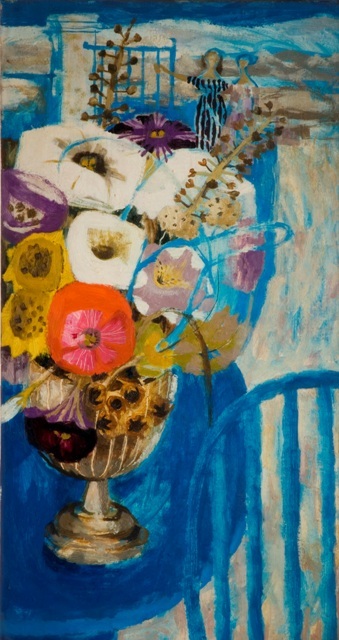 Acquired for the Permanent Collection in 1960 from the Royal West of England Academy, with whom she had a lifelong association, Flowers in Tuscany is dated mid 20th century. Another painting by Fedden, Flowers on a Tiled Floor 1956,* which depicts a very similar arrangement of flowers and a mountain back drop, may provide a clue to a more exact date when the former was painted. Fedden travelled extensively, particularly in France and Tuscany, producing many sketchbooks full of ideas, and Flowers in Tuscany probably resulted from one of these trips. Italy must have been a special place for Fedden, as it was there, in 1949 that she holidayed with a friend from the Slade School of Art (where she had studied), the artist Julian Trevelyan, following the breakdown of his marriage. It was on this trip that the pair fell in love and on their return, Fedden joined him at his home and studio in Durham Wharf, where she lived and worked for the rest of her life. Trevelyan, who was predominantly a printmaker, had a profound effect on the development of her work, as did the artists Henri Matisse, Georges Braque, Ben and Winifred Nicholson, and Christopher Wood with their use of flattened picture planes, separation of still life objects and interpretation of colour. Trevelyan, who was linked to the Surrealist movement, encouraged Fedden to flout the rules of perspective and exploit disproportion in her work; large and small objects appearing transposed in scale and often it takes on a dreamlike quality. Flowers in Tuscany is typical of her still life studies in that it is positioned in front of a landscape, revelling in the contrast of disparate elements. In this painting Fedden experiments and pushes the boundaries of perspective; a classical urn appears in profile whereas the table top is tipped vertically towards the viewer, creating a large round shape on which to anchor the vase of flowers, echoing the circular motifs of the chair back, the curves of the vase and the blousey blooms spilling out of it. These in turn, contrast with the overlaid verticals of the chair rods, which are repeated by the gateposts in the background, linking the whole composition. The chair is more abstract shape than an accurate rendering, it is a suggestion for the viewer to complete. For Flowers in Tuscany, Fedden has worked in oil paint on a canvas which she probably stretched and primed herself, something she used to do at this point in her painting career. Her method of working would often involve her sketching in the basic structure of a composition and building up the initial image using turpentine thinned paint, before applying numerous layers of thicker paint. The enjoyment she got from this process is evident in her energetic brushstrokes and confident handling of the paint. The differing thicknesses of paint are clearly discernible in this work. Occasionally the canvas peeps through and the under painting is visible; thinner, almost transparent paint such as used on the chair back contrasts with the texture of the brush marks where she has laid down the undiluted oil paint. Her use of sgraffito on the ribs of the vase and red flower boldly tears through the impasto to expose the support beneath. Flowers in Tuscany is an example of her earlier more soft edged style, where the outlines of her objects are less defined, something she wished she could recapture in her later, more mature work. The vivid Mediterranean blue colour which predominates Flowers in Tuscany evokes Southern European skies and is used throughout the painting, linking the whole composition. In contrast, the bright pink and red of the trumpet flower at the forefront of the arrangement catches the eye, inviting the viewer into the painting. The rolling mountains in the background stand out against the deep blue sky but elements of this blue are also incorporated. The area to the right of the table shares the same colour palette as the mountains but is made distinct from them due to the change in direction and style of mark making with much shorter, vertical staccato brush strokes. There is a stillness to this right hand passage of the painting which counterbalances the busyness of the floral arrangement. The flowers sit brazenly in their vase; a joyous celebration of the surrounding earth’s spoils, the dark centres of their elliptical vortices staring out of the picture plane. Tall skeletal seed heads provide a pathway from the foreground to the hills in the distance behind them. A further visual link is provided by the fluid loop of bright blue paint which dances across the blooms. At first it appears to be a part of the under painting, but on closer inspection it shows itself to be a later addition, painted after they were completed. A very definite statement, it sweeps across the trumpet flowers, weaving in and out of them like the after image left by a child’s sparkler. Finally, barely perceptible, two ghostly figures stand near the open gate. The colour of the baked mountain earth, they are almost on the point of becoming part of the landscape. The woman on the left holds onto the gate, there is a tension in her arm which appears to be supporting her weight as she leans towards her companion, whose right arm encircles her waist in a subtle act of balancing. Her striped dress mirrors the gateposts next to her. They provide the only clue to who the flower gatherers and arrangers might be in a scene otherwise devoid of human presence. Mary Fedden was a trailblazer becoming the first female tutor in the Painting School at the Royal College of Art (from 1956 to 1964), teaching a golden generation of artists including David Hockney and Patrick Caulfield, and was elected a Senior Royal Academician in 1992. During the 1960s and 70s her work was somewhat eclipsed by that of Trevelyan’s, but subsequently her reputation has justifiably grown. Fedden’s long painting career has resulted in a large legacy of work. She painted every day, it was what she loved to do, and continued to do, right up until her death at the age of 96 in 2012. Her work could be described as a celebration of the everyday, but it is one in which she elevates the ordinary to the extraordinary.